LoRa is a radio Physical layer (PHY) modulation technology focusing on battery-powered endpoints over long-range radio connectivity. It offers long air propagation distance, low power consumption, high receiving sensitivity, low data rates, robust spectrum spreading, and secured encryption transmission. LoRaWAN is a Media Access Layer (MAC) protocol specification defined and maintained by the LoRa Alliance on top of the LoRa radio physical layer. It characterizes the device-to-infrastructure (LoRa®) physical layer parameters & (LoRaWAN™) protocol and so provides seamless interoperability between manufacturers. It is designed to scale from a single gateway infrastructure up to large global networks with many devices. A LoRaWAN network architecture is deployed in a star-of-stars topology in which gateways relay messages between end-devices and a central network server. A peer-to-peer communication using LoRa technology allows a direct communication and long-distance between 2 devices. This is particularly useful in restrained environment where global LoraWAN infrastructure is not needed or simply not available. Or in a hybrid infrastructure, where some devices will be set to only communicate thru peer to peer (low latency, low Opex) while others will also be connected to LoraWAN infrastructure (gateway). There are many applications for peer to peer Lora connectivity taking full advantage of the Long-range and low power characteristics of Lora technology. It includes garage door-opener (GDO), smart home or industrial smart sensors, alarm systems, commissioning of LoraWAN network. Last but not least, the high-link budget offers a 30-dB improvement over FSK to reject co-channel interference and delivers power consumption seven times lower to minimize operational cost. This makes LoRa a viable option for increasing efficiency across a very wide range of applications. 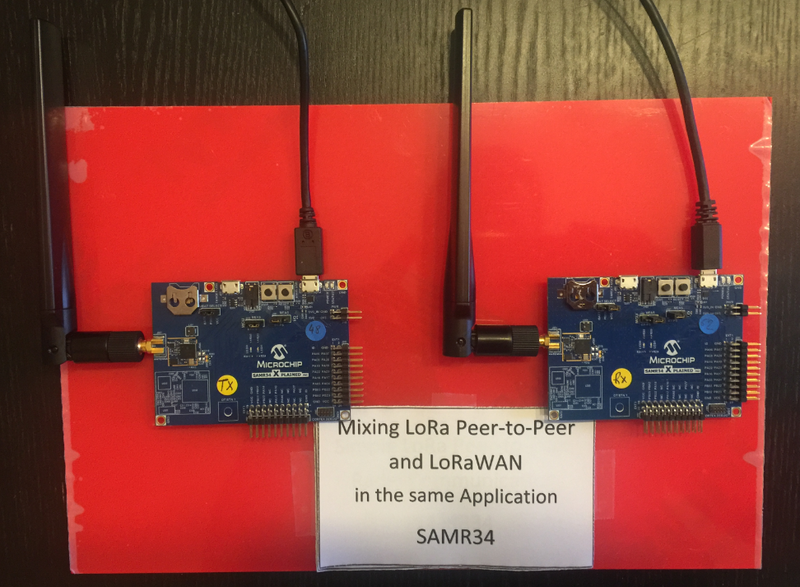 Different peer-to-peer examples illustrate the various application of the LoRa technology embedded insider the ATSAMR34. The ATSAMR34 Xplained Pro evaluation kit is a hardware platform used to evaluate the ATSAMR34 Low Power LoRa® Sub-GHz SiP. It is supported by Atmel Studio 7.0 IDE and a collection of sample codes are available from Advanced Software Framework (ASFv3) since the 3.44.0 release. 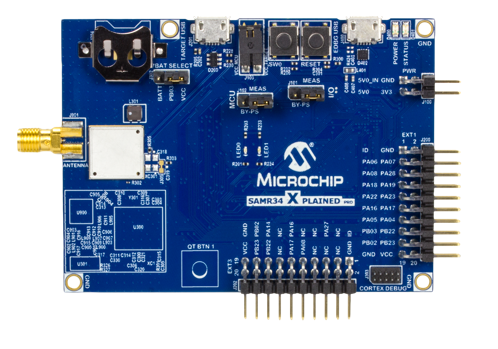 The Xplained Pro MCU series evaluation kit includes an on-board Embedded Debugger (EDBG), and no external tools are necessary to program or debug the ATSAMR34. The kit offers a set of features that enable you to get started with the ATSAMR34 Low Power LoRa® Sub-GHz SiP peripherals right away, and to understand how to integrate the device in your own design. Here the list of software used in this tutorial. Download and install Atmel Studio 7.0 IDE. Open Atmel Studio 7.0 IDE. Then, you need Advanced Software Framework (ASFv3) installed as an extension to Atmel Studio. From the menu, go to Tools -> Extensions and Updates ... and install Advanced Software Framework (>= 3.44.0 release). Once the installation is complete, you must restart Atmel Studio. Note: ASFv3 is an MCU software library providing a large collection of embedded software for AVR® and SAM flash MCUs and Wireless devices. ASFv3 is configured by the ASF Wizard in Atmel Studio 7.0 (installed as an extension to Studio). ASFv3 is also available as a standalone (.zip) with the same content as Studio extension (https://www.microchip.com/mplab/avr-support/advanced-software-framework). Until the next Atmel Studio IDE release, you have to manually install the Device Part Pack for developing with SAMR34/R35 on Atmel Studio 7.0 IDE. (all products released in between IDE releases of Atmel Studio should be manually added by user to develop applications). To demonstrate peer-to-peer communication, you do need at least 2x ATSAMR34 Xplained Pro boards. In order to connect to a LoRaWAN Network, you will need to be in range of your gateway. If you don't have a gateway, check the world map (https://www.thethingsnetwork.org/map) to see if your local community has gateway deployed around your location. Plug the antenna and always make sure you have the antenna plugged to your board before powering it up. Connect your board to the PC through the micro-USB cable. USB cable must be connected to the EDBG USB connector of the ATSAMR34 kit. Wait for USB driver installation and COM port mounting. The USB port powers the board and enables the user to communicate with the kit. Launch Tera Term program and configure the serial port mounted with: 115200 bps 8N1. 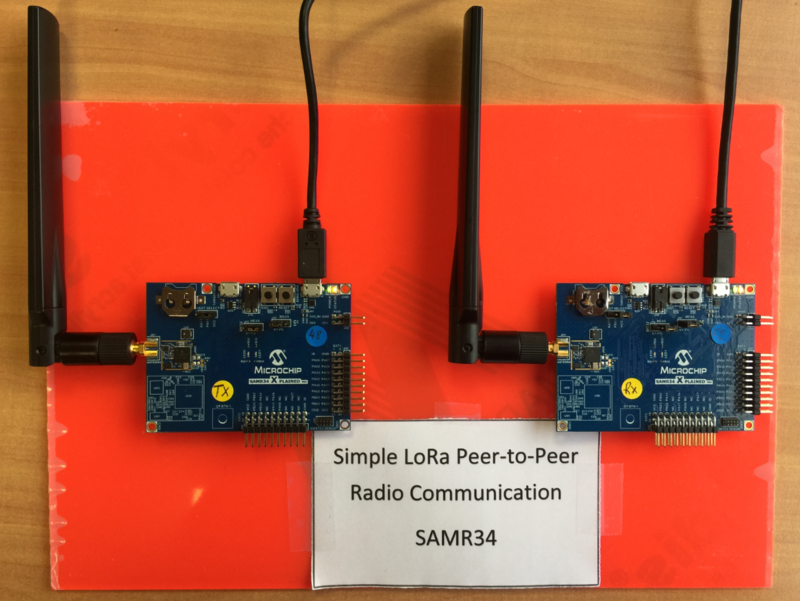 This simple example demonstrates how to establish a peer-to-peer communication between 2x ATSAMR34 Xplained Pro boards using LoRa modulation by the help of the Radio APIs delivered in the Microchip LoRaWAN Stack (MLS). Based on LoRaWAN Mote Application generated from ASFv3, this sample code demonstrates the coexistence of a LoRaWAN Application and a pure radio communication between 2x ATSAMR34 Xplained Pro boards using LoRa modulation. 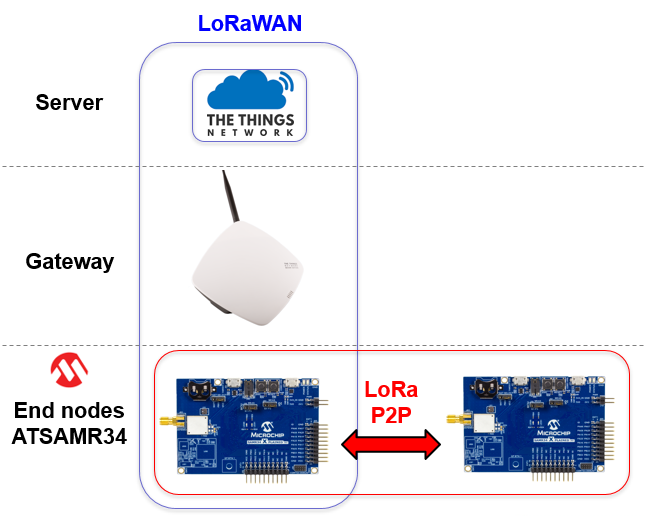 The Peer-to-Peer communication is enabled by the help of the radio APIs delivered in the Microchip LoRaWAN Stack (MLS). MiWi™ Development Environment (MiWi™ DE) is developed by Microchip to support a wide range of wireless applications. The backbone of MiWi™ DE is MiMAC and MiApp interfaces, which link the support of multiple RF transceivers as well as wireless communication protocols together as a well-defined simple but robust Microchip proprietary wireless development environment. MiWi™ DE is defined in three layers: application layer, protocol layer and RF transceiver layer. The three layers are linked together by MiMAC and MiApp interfaces. Application layer uses MiApp interfaces to talk to the protocol layer. 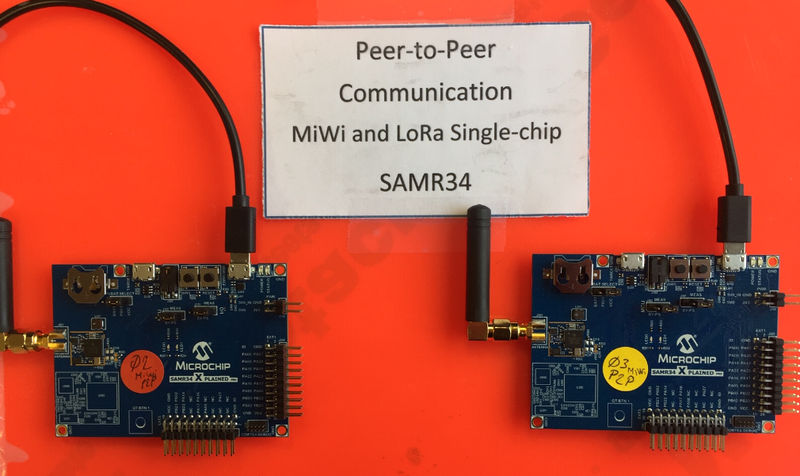 On top of the LoRa Radio transceiver embedded in the ATSAMR34 device, the MiWi™ stack can enable a Simple Peer-to-Peer communication with a very small foot-print. The Long-range capable radio can offer a perfect solution for a department store HVAC or alarm application or a large smart home application. 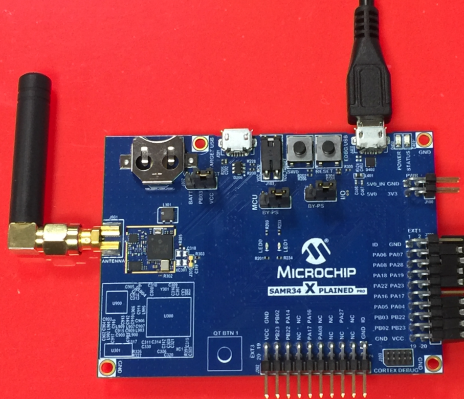 Note: In this application, the TAL (Transceiver Abstraction Layer) from the Microchip LoRaWAN Stack is re-used. The TAL uses the radio drivers and provides access to the LoRa Transceiver embedded in the ATSAMR34. The sample application will be available soon.